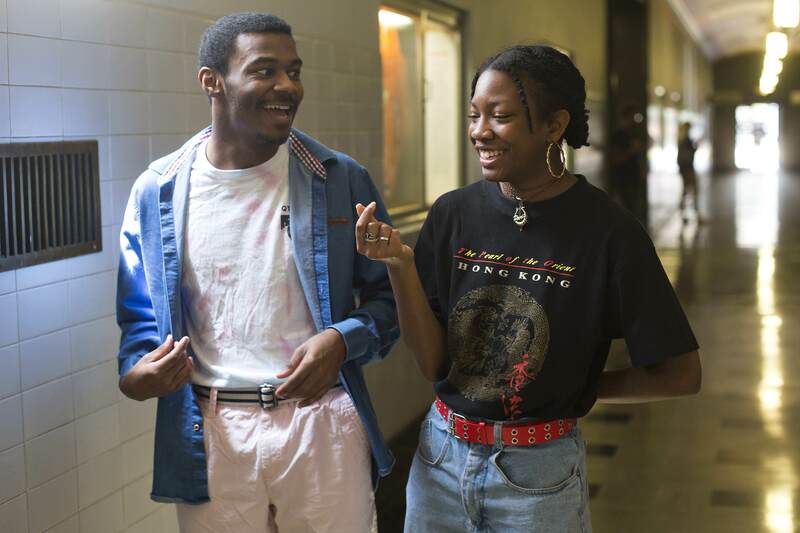 Psychology and government freshman Orlando Beckum II, left, and radio-television-film freshman Paris Vincent both identify as non-binary, a term to describe gender identities outside of the traditional male or female gender. Though radio-television-film freshman Paris Vincent was assigned female at birth, being called a girl never felt completely right. Vincent was labeled a tomboy by their peers and struggled with their gender identity throughout their childhood. It wasn’t until a light-hearted conversation with friends at UT that Vincent finally found an answer to their questions. Vincent now identifies as non-binary. Non-binary is typically used as a catch-all term for gender identities outside of the traditional gender binary of male and female, but some non-binary students believe this definition is too simplistic. Vincent explained their non-binary gender depends on their mood. Studio art sophomore Melissa Garcia said they think of their non-binary identity like their pansexuality, a sexual orientation in which an individual is attracted to members of all genders. While Vincent has known since last semester that they are non-binary, they haven’t told their parents yet. Other non-binary UT students, such as psychology and government freshman Orlando Beckum II, experienced acceptance from their family after coming out. “There are so many people who are not heterosexual in my family, and my mom accepts all of them because she grew up around people who weren’t heteronormative,” Beckum said. While Garcia has not come out to their parents, they said their mom often questioned their decision not to act feminine. Though Vincent doesn’t know how their parents will react, Vincent has had positive and encouraging experiences openly expressing themself with their peers at UT. But Vincent said they’re still afraid that people will treat them differently once they find out they’re non-binary. On the other hand, Beckum said internalized homophobia negatively affects their perception of everyday occurrences, recalling a time when they wore a dress on campus and a group of men nearby started laughing. “I didn’t know if they were actually laughing at me, but I felt that this was society laughing at me,” Beckum said. Garcia explained that despite not facing any major challenges in regards to their gender, they have experienced some mishaps in the classroom. In spite of the situations they may encounter, Vincent, Garcia and Beckum credited their non-binary identities with helping them in their personal pursuits. Garcia said their gender influenced their art by encouraging them to explore more personal subjects through photography, while Beckum said being non-binary helped them become a more accepting person. “I can show that the people different from you are just as kind and courageous as you can be if you were as accepting,” Beckum said. Vincent said they plan to use their experiences to become a role model for other non-binary or queer individuals.